Glastonbury Forum: Pulp To Reform In 2010? Topic: Pulp To Reform In 2010? Pulp To Reform In 2010? Jarvis Cocker has hinted that his former band Pulp may reunite to play Glastonbury 2010. 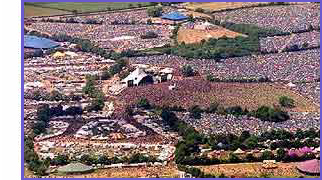 In an interview with the People, the singer said: "Glastonbury means an awful lot to me, I would love to play there again. We've talked about it, there we go, there'll be a band reunion." Though Cocker does not confirm that the band is Pulp, it seems the only obvious choice as he has never been a member of another group. The Sheffield band were together for more than 20 years before calling it a day in 2002. The group enjoyed success at the height of the Britpop era in the mid-90s, particularly with fifth album Different Class, which won the Mercury prize in 1996. They headlined Glastonbury in 1995, after the Stone Roses cancelled at the last minute, and their performance is widely regarded as one of the best in the festival's history. If Pulp do re-form to play Glastonbury 2010, they will follow in the footsteps of their Britpop peers Blur, who reunited to headline this year's festival. Cocker isn't the only subject of Glastonbury lineup speculation. Robert Plant has said he hopes to perform at next year's festival – he's just not sure with whom. The former Led Zeppelin frontman revealed that he has spoken with organiser Michael Eavis, but hasn't worked out which musicians he may play with. "There's a place for me there, but I have no idea who with," Plant told BBC 6 Music at yesterday's Q awards. Though Plant is best known for his role in Led Zeppelin, he has released several solo albums – including an acclaimed LP with bluegrass singer Alison Krauss. Despite persistent reunion rumours since Led Zeppelin's one-off re-formation in 2007, Plant has given priority to his Mercury-nominated, Grammy-winning work with Krauss. When one journalist suggested that Plant could play Glastonbury by himself, the singer joked, "Oh yeah, yeah, yeah. I'm good at card tricks". Next year marks Glastonbury's 40th anniversary and already the Somerset festival has sold out. Though the lineup has yet to be announced, bookmakers are offering Morrissey, U2, Radiohead, Coldplay, and the Rolling Stones as favourites to play. But at least one major act can be counted out – Sonic Youth said that they are "not really" interested in playing. "We're not really big on festivals because you don't soundcheck, you just go out," said Kim Gordon. "The last time we played there we had Bob Dylan's audience or something. It wasn't that much fun." While Plant's plans have yet to be finalised, there seems a good chance that Them Crooked Vultures, a supergroup comprising Led Zeppelin's John Paul Jones, Queens of the Stone Age's Josh Homme and Foo Fighters' Dave Grohl, could play. The band sold out their first UK tour before they had even released a song. Their self-titled debut will be released 17 November.